Solomon was given the royal title of King. He wasn’t his father, King David’s, firstborn son. He was the son of Bathsheba. David and Bathsheba committed adultery while she was married to Uriah the Hittite. David had him murdered in battle and married Solomon’s mother. David and Bathsheba conceived a son in their sin. After the man of God corrects David and he repents, the child dies. Then along comes Solomon. David’s desire was to build a house for God. But due to his “bloody hands” and because he was a “man of war”, God couldn’t allow it. 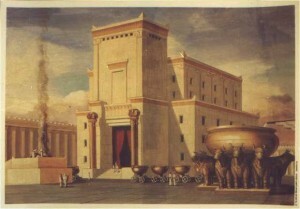 In his place, Solomon spent seven years with literally hundreds of thousands of men to build the temple, using the finest stones, lumber and precious metals. If you read I Kings and II Chronicles you can see the splendor. David designed it. Solomon built it. When Solomon was to become King, God asked him to ask for whatever he wanted. As a new young King, with big shoes to fill, he asked for wisdom to rule the people. God was so pleased that He gave him the wisdom as well as riches and honor. In all time, Solomon was the wisest and richest man ever to live. A great beginning. I believe chapter 11 of I Kings explains the heart of the matter.”Solomon loved many foreign women.” It’s not just that he married them, when it was forbidden by God, “You must not intermarry with them, because they surly will turn your hearts after their Gods.” No, the real issue was his heart. He “held fast to them in love.” And sure enough, “as Solomon grew old, his wives turned his heart after other gods, and his heart was not fully devoted to God, as the heart of David, his father had been” (verses 1-5). He ended up following other gods, including Molech who demanded they sacrifice their children by fire. It’s pretty simple, really. God knows what is best for us. When we listen, things are good. When we don’t things aren’t so good. Sure bad things happen to all of us; after all we live in a fallen world that is under Satan’s control. But do you want to face them alone, or go through them with God on your side. It’s kind of a no-brainer. Priorities. We all love our families, our Churches, our hobbies, interests, some of us our jobs, etc. But we need to love God best, or as my granddaughter used to say “the most-est”. Now, we don’t do that by “working” ourselves up like an actress getting ready to film the big love scene. Instead it’s something we work at, and work towards. Build a relationship that nothing else can replace or compare to. Choose God, first and foremost. By the way, Solomon recognized his error and set his priorities straight, but how much time was wasted? What kind of example did he set for his son’s who were destined to rule? Read the rest of Kings and Chronicles. Things didn’t work out too well for his descendants, most of whom “did evil in the sight of the Lord”. What example do you want to leave? This entry was posted in Thoughts and tagged faith, future, God, honor, hope, I kings, II Chronicles, King David, King Solomon, love, priorities, scripture, Solomon, temple, trials, wives, worship.